Montage of Rainbow and Clouds over Big Cypress National Preserve, Southern Florida. Where in the United States is Florida? Location map of Florida in the US. 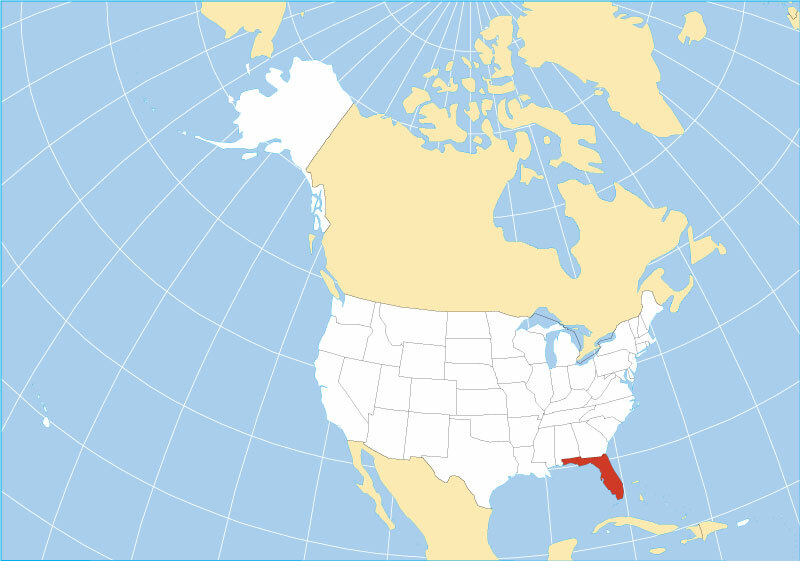 Florida is an internationally well known US state in the southeastern part of the United States, mostly situated on a large peninsula that extends roughly from north to south into the Atlantic Ocean and the Gulf of Mexico. 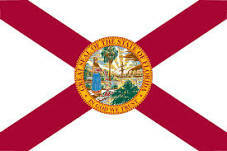 The Sunshine State (its Nickname) is bordered in north by the US states of Alabama and Georgia. The territory of La Florida was ceded to the United States by Spain in 1819, it was then known as Florida Territory. Admission to the Union on 3rd March 1845, as the 27th state. The peninsula has an area of 170,304 km² (65,755 sq mi) , over one-fifth of the state is water. Florida features more than 12,000 km² (4,700 sq mi) of lakes, with 7,700 of them greater than 4 hectare in size. The state is slightly larger than twice the size of Austria. Compared with other US states, Florida would fit more than four times into Texas. Because its terrain is mostly flat, Florida's geographical features would be more or less boring, if there wouldn't be about 10,000 lakes; the Florida Keys with thousands of islands and islets; the second longest coastline in the entire USA (after Alaska) with a length of 2,170 km (1,350 miles) it is a very long beach; and there is the Big Cypress Swamp and The Everglades, a large area of subtropical wetlands in the southern portion of the U.S. state. And, its pleasant climate ranges from sub-tropical to tropical. 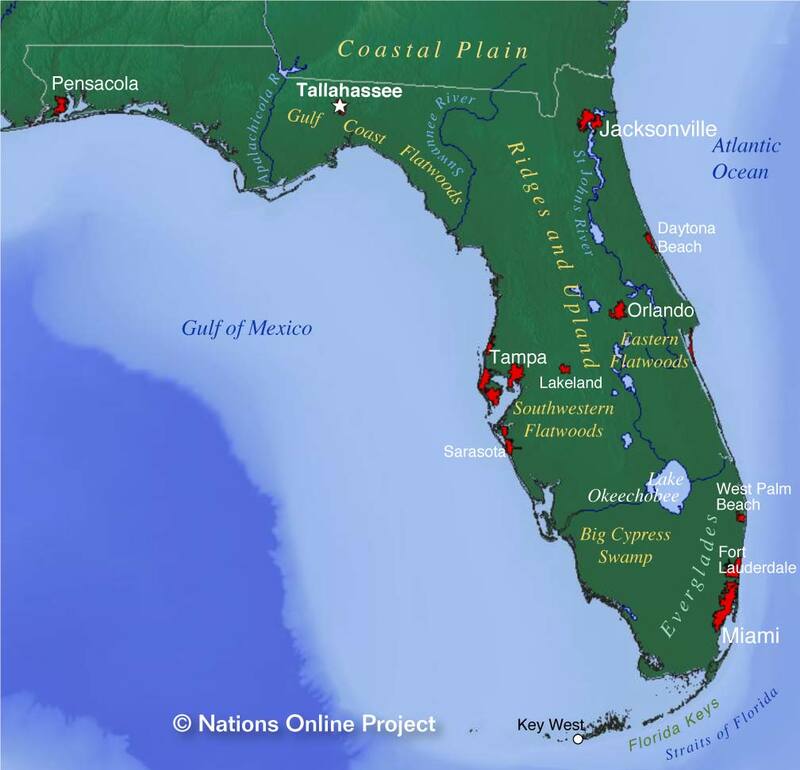 As mentioned above, the State of Florida is situated on a peninsula, which consists of karst limestone sitting atop bedrock known as the Florida Platform. The peninsula is bordered by the Gulf of Mexico in west, the Atlantic Ocean in east, and by the Straits of Florida in south. Several Caribbean countries are geographically close to Florida, particularly The Bahamas and Cuba. 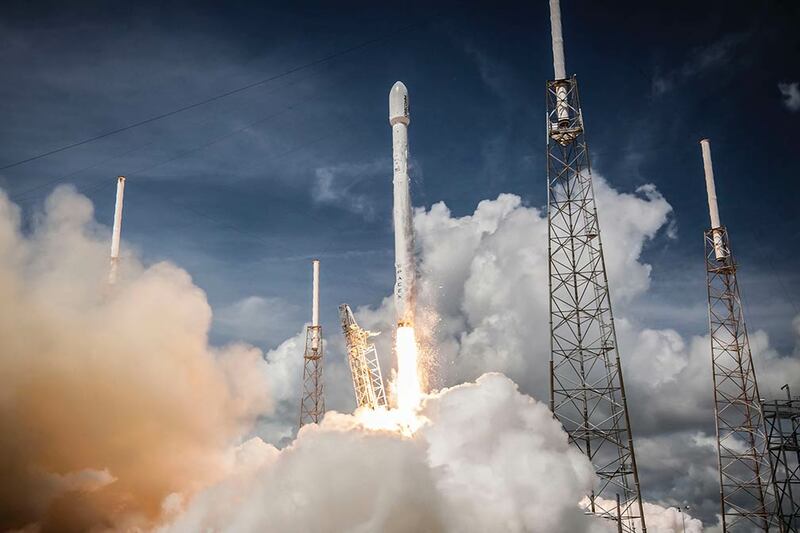 And we have lift-off - SpaceX Falcon 9 from Kennedy Space Center at Cape Canaveral Air Force Station, Florida. Highest natural point in the state is Britton Hill with a summit elevation of 105 m (345 ft), Florida's highest peak would be on top of the Four Seasons Hotel Miami with 240 m (789 ft). Largest freshwater lake in the state of Florida is Lake Okeechobee (surface area 1,900 km² (730 sq mi)), referred to by locals as 'The Lake' or 'The Big O'. Lake George, a large, broad and shallow lake with brackish water. Lake Seminole, a reservoir filled by Chattahoochee/Flint River and emptied by the Apalachicola River. Lake Kissimmee, recreational lake in wildlife rich Lake Kissimmee State Park. Lake Apopka, near Orlando, once a great bass fishing lake, it became Florida's most polluted large lake. According to St. Johns River Water Management District, that ongoing restoration efforts caused the phosphorus concentrations in the lake to decline significantly. 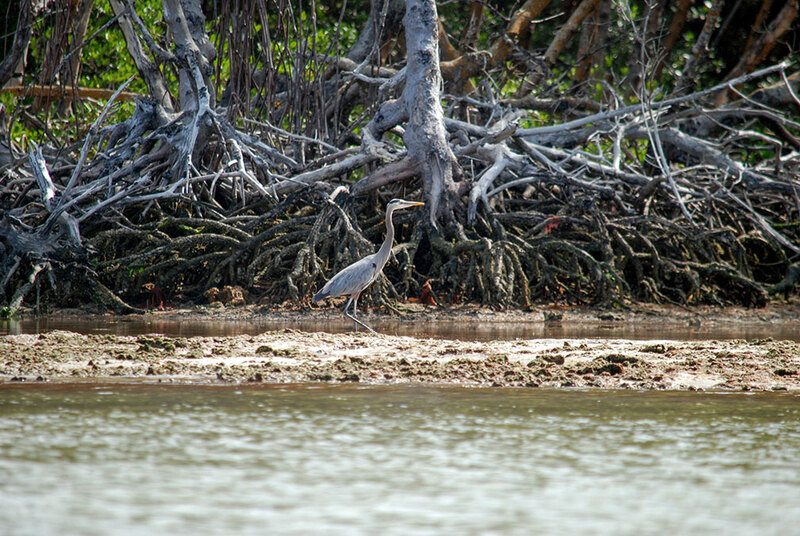 Great Blue Heron and Black Mangroves in Florida's Everglades National Park. Florida has one UNESCO World Heritage Site. At the southern tip of the peninsula is the largest designated sub-tropical wilderness reserve on the North American continent, known as the Everglades. The Everglades National Park offers a variety of wetlands with fresh and brackish water, shallow bays and deeper coastal waters, tropical hammocks and rainforest, and the largest mangrove ecosystem in the Western Hemisphere, making it a sanctuary for a large number of birds and reptiles, as well as for threatened species such as the manatee (sea cow; Trichechidae), but the park also became a heaven for non-native species which are a considerable growing problem for the property. !! The Glades was placed on the List of World Heritage in Danger in 2010 due to degradation of the property resulting in a loss of marine habitat and decline in marine species. The diversion of water to South Florida's still-growing metropolitan areas is the Everglades National Park's number one threat. Size matters. 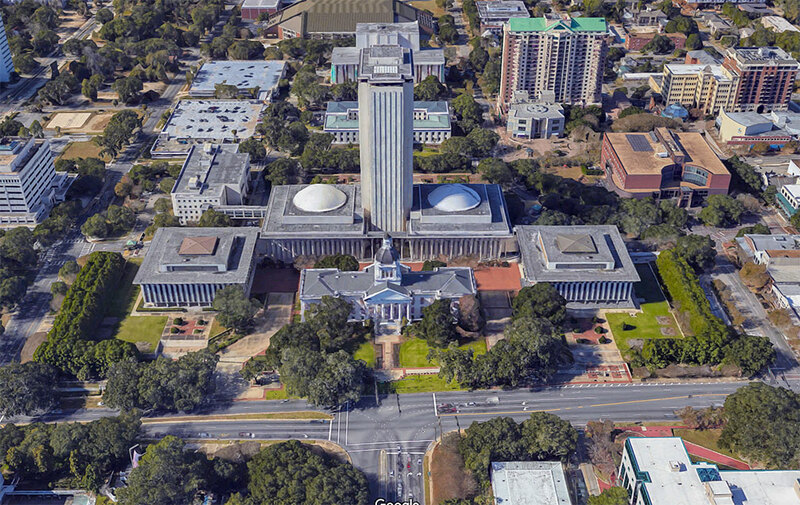 Rendered image of Florida State Capitol Complex in Tallahassee (Old Capitol in foreground). The 22-story Executive Office Building (aka New Capitol) is among the tallest capitol building in the US. Florida has a population of 20.7 million people (est. 2018) , it is now the 3rd most populous state in the US, after California, and Texas. Capital city is Tallahassee, most populous city is Jacksonville (pop: 880,000), most populous metropolitan area is Miami-Fort Lauderdale-Pompano Beach with 5.5 million people. Other major cities are Miami, Tampa, Orlando, St. Petersburg, and Hialeah. Spoken languages are English (75%) and Spanish (19%). Busiest airports in the state are Orlando International Airport (IATA code: MCO), Miami International Airport (IATA code: MIA), Tampa International Airport (IATA code: TPA), and Fort Lauderdale–Hollywood International Airport (IATA code: FLL). 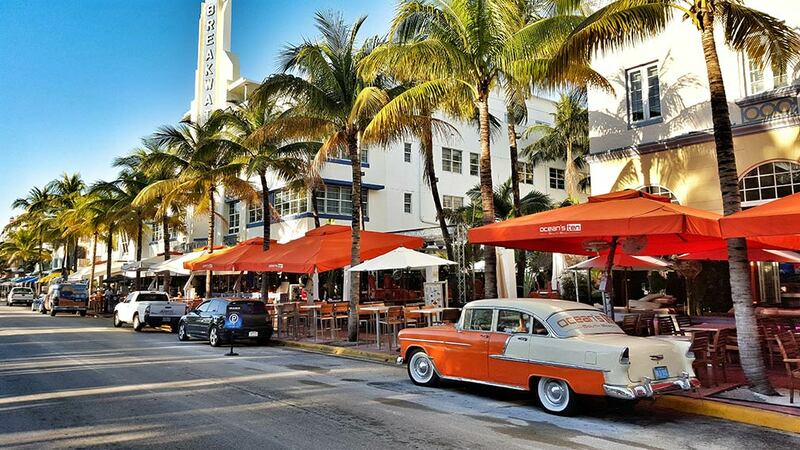 Ocean Drive, Art Deco District, Miami Beach, Florida. Apalachicola, Arcadia, Avon Park, Bartow, Belle Glade, Boca Raton, Bonita Springs, Bradenton, Brooksville, Cape Coral, Clearwater (part of Tampa Bay Area), Coral Springs, Crestview, Dade City, Daytona Beach, De Funiak Springs, De Land, Delray Beach, Deltona, Eustis, Everglades City, Fernandina Beach, Fort Lauderdale (part of Miami-Fort Lauderdale-Pompano Beach metropolitan area), Fort Myers, Fort Pierce, Fort Walton Beach, Gainesville, Hialeah, Hollywood, Homestead, Islamorada, Jacksonville (largest city), Jacksonville Beach, Jupiter, Kendall, Key Largo, Key West, Kissimmee, Lake City, Lake Wales, Lakeland, Largo, Leesburg, Live Oak, Madison, Marathon, Marianna, Melbourne, Merritt Island, Miami (largest metropolitan area), Miami Beach, Moore Haven, Naples, New Smyrna Beach, Ocala, Okeechobee, Orlando (Disney World Orlando), Ormond Beach, Pahokee, Palatka, Palm Bay, Palm Coast, Panama City, Pensacola, Perry, Pompano Beach, Port Charlotte, Port St Joe, Port St Lucie, Punta Gorda, Sanford, Sarasota, Sebring, Spring Hill, St Augustine, St Petersburg (part of Tampa Bay Area), Starke, Tallahassee (capital city), Tampa (part of Tampa Bay Area), Titusville, Valparaiso, Vero Beach, West Palm Beach, and Winter Haven. 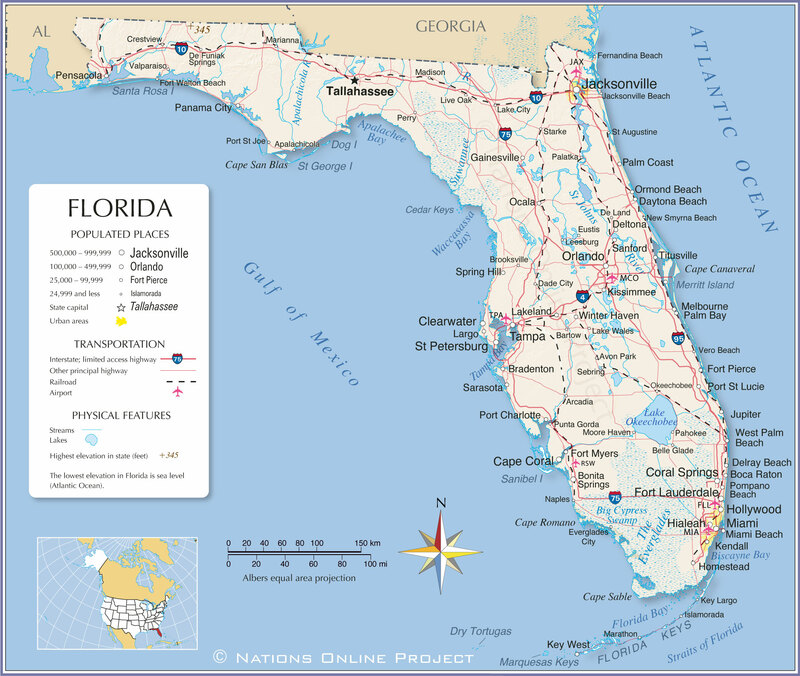 The detailed map below is showing the US state of Florida with boundaries, the location of the state capital Tallahassee, major cities and populated places, rivers, streams and lakes, interstate highways, principal highways, and railroads. The 'Capital of Latin America'.